Who doesn’t love chocolate, especially when it is given (or received) as a gift. That’s what I thought when I received this gorgeous Valentines Goody Bag from Hotel Chocolat to sample and review. It contains Milk Hearts (which are filled with Praline Ganache), Raspberry Fusion Slab, Strawberry Heart Lick (which is a lollipop), Passion Fruit Truffles, and Raspberry Truffles. Delivery is available internationally. My own particular favourites were the Passion Fruit Truffles, which consist of Passion Fruit Ganache encased in a crisp chocolate shell. 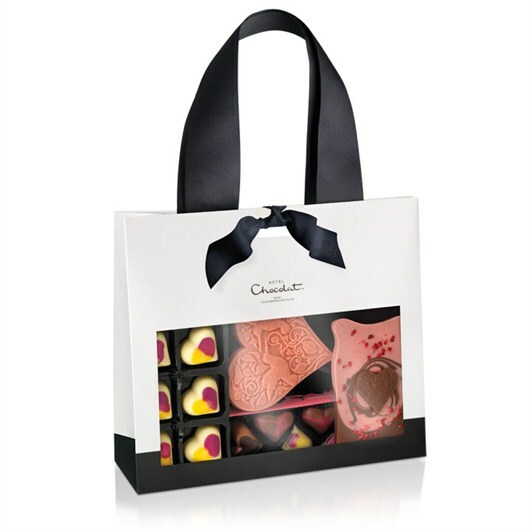 Hotel Chocolat‘s gifts and collections are aimed at the luxury market, but there are prices to suit all pockets. They also take bespoke orders for the Corporate and Hospitality sectors, as gifts and promotions, under the slogan “Your logo, our Chocolates”. Verdict: The packaging of the goody bag is elegant, and is the perfect gift for St. Valentines Day. The overall quality and flavour of the chocolate is excellent, with an emphasis on “more cocoa, less sugar”, and it shows. These are chocolates to be savoured, and appreciated. The fruit flavours compliment the cocoa content, and neither overpowers the other. The chocolates in this pack are not suitable for those on a Gluten-Free diet. They may contain traces of nuts. They are, however, alcohol-free, and also suitable for Vegetarians. The Goody Bag, priced at STG£19.00, is available in their stores and online, but hurry, the Valentines Collection is available to order up until 6pm on 13th February Day. Disclosure: I received the Goody Bag for review purposes.